Born in Ôsaka in 1820. 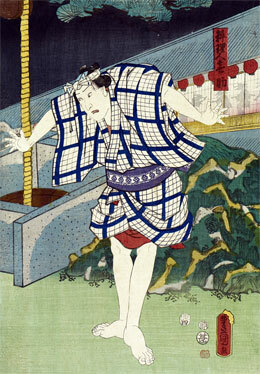 He started his career as a disciple of Ichikawa Hakuzô I, who gave him the name of Ichikawa Hakunosuke. He was trained in a troupe of children-actors (kodomo shibai) and went to Edo in Fall 1836, playing in the 11th lunar month of 1836 at the Moritaza in the kaomise drama "Kioi Genji Mitsugi no Tamamono". 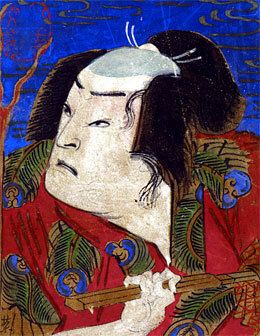 He became disciple of Nakamura Utaemon IV and received the name of Nakamura Kannosuke I. Then, he took the name of Nakamura Tsurugorô II in the 11th lunar month of 1839 at the Ichimuraza, playing in the drama "Taiheiki Irifune Shinozuka". 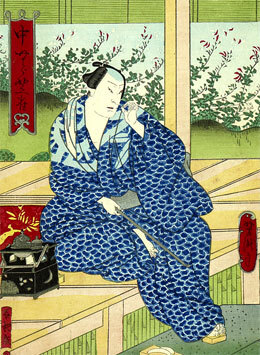 He took the name of Nakamura Shibajaku I in the 5th lunar month of 1846 at the Kawarasakiza, playing the roles of Terukuni and Shioyaki Gorôsaku in the drama "Tenmangû Wakaba no Goaiju". He appeared on stage in Edo for the last time in the 9th lunar month of 1855, playing at the Nakamuraza in the drama "Matsu ni Ichô Tsurukame Soga". He went back to his native city of Ôsaka but fell sick and had to retire. He died in Ôsaka the 5th day of the 4th lunar month of 1856. Nakamura Shibajaku I was a good supporting actor, able to play wagotoshi, wakaonnagata or katakiyaku roles. The actor Nakamura Jakuemon II held the name of Nakamura Shibajaku II from the 4th lunar month of 1866 to February 1875. Born in Ôsaka in 1856. He was adopted by Nakamura Shibajaku II and started his career in a troupe of children-actors (kodomo shibai), performing under the name of Nakamura Sannosuke. 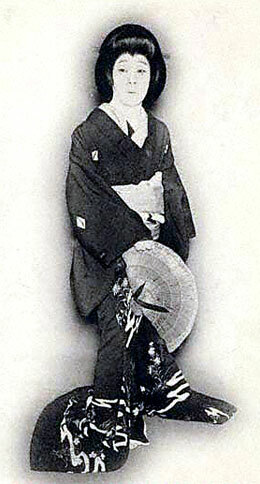 He took the name of Nakamura Shibajaku III in September 1877 in Ôsaka at the Ebisuza, playing in the drama "Iroha Jikki". 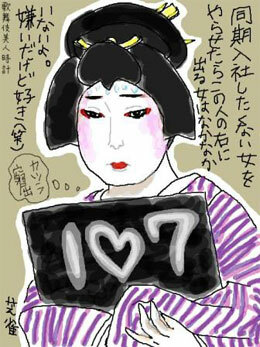 He made almost all his tachiyaku career in Ôsaka, performing in either Kabuki or modern dramas. His field of excellence was wagoto. He died the 17th March 1890. 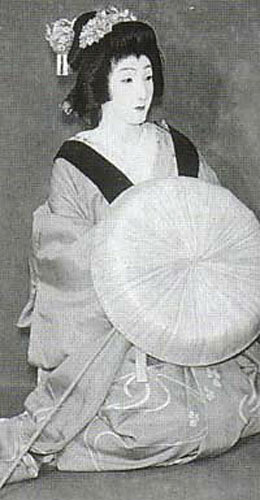 The actor Nakamura Jakuemon III held the name of Nakamura Shibajaku IV from September 1891 to September 1918. Born the 13th January 1918. He was the son of Nakamura Jakuemon III and started his acting career in 1922. He performed under the name of Nakamura Shôkei (his real name). He was left alone after the sudden death of his father in 1927 and received the patronage of Onoe Kikugorô VI from 1933. He settled in Tôkyô and started to learn the art with his new master. He was drafted in the Japanese Imperial Army and died on the Chinese battlefront the 22nd of December 1939. He posthumously received the name of Nakamura Shibajaku V in February 1940 . His childhood friend was Ôtani Hirotarô I, the future Nakamura Jakuemon IV and future father of Nakamura Shibajaku VII. 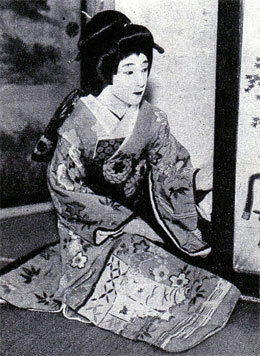 Nakamura Shôkei (Nakamura Shibajaku V) playing the role of Shinobu in the drama "Benkei Jôshi"
The actor Nakamura Tokizô IV held the name of Nakamura Shibajaku VI from April 1953 to March 1960. Nakamura Shibajaku VI playing the role of Konami in the drama "Kanadehon Chûshingura"
The actor Nakamura Jakuemon V held the name of Nakamura Shibajaku VII from September 1964 to February 2016. A drama similar to "Ise Ondo Koi no Netaba". There was a posthumous shûmei ceremony the 21st of February 1940 in Ôsaka.